NEW BRITAIN - It took 40 minutes for Wethersfield to show the New Britain girls soccer team just how much work still needs to be done this season. After allowing one goal through the first half, the match went downhill quickly for the Hurricanes, who fell to the Eagles 8-0 Tuesday afternoon at Veterans Stadium. Over the first 40 minutes of play, the Hurricanes (0-2) relied on their defense to get them through the game and it was up to the task, consistently finding ways to thwart the Eagles’ attack. After an 8-0 loss to Newington earlier this week, New Britain knew it had to start the game on a strong note. Wethersfield took 20 shots on goal in the first half with the lone goal coming at the 23:12 mark when Madison Righi sank the ball into the bottom left-hand corner. 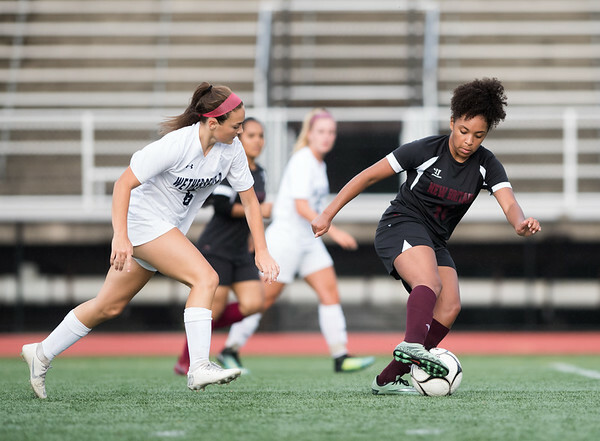 Once New Britain came back for the second half, the Eagles continued to control the time of possession, but this time found the back of the net. Overall, Pugliares was not impressed with his team’s effort. “I was really upset about the attitude that they showed in the second half,” Pugliares said. “If we do what we did in the first half for the rest of the season, we’re going to be a team that nobody wants to play. I think we had a good half and I think if that’s the way we play this year, [teams]’ll know they’re in for a tough game. Seven different players scored for Wethersfield over those final 40 minutes, including Madison Righi, Alyssa Prosperi, Alexis Szymecki, Emma Klementon, Anie Klementon, Taylor Adduci and Ana Villagra. New Britain’s keeper, Marilou Gonzalez, nearly saved two of the Eagles’ goals. The first was a high flying ball that nearly missed the top of her fingers with 11:48 left in the game. The other came 24 seconds later when it appeared she caught the ball but it rebounded out of her arms and into the goal. Gonzalez made a total of 13 saves on the afternoon. The Hurricanes on the other hand, managed just a single shot the entire game. Posted in New Britain Herald, New Britain on Tuesday, 11 September 2018 21:14. Updated: Tuesday, 11 September 2018 21:16.